Our heavy duty plastic / polythene bags are invaluable in many different work areas, especially when you want to pack a heavyweight object in a plastic bag. Made from 400 gauge high quality clear polythene (100 microns), the superior strength of our heavy duty plastic bags ensures that your products are kept safe, dry and clean whether in storage or in transit. Our poly bags are versatile enough to meet all your packing needs and are available in 12 different sizes to pack a wide range of products – big or small! And with high clarity, it’s easy to check the packs’ contents. Bag sizes stated are internal dimensions; width (opening) x length. 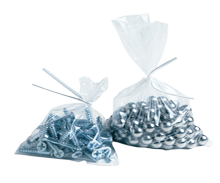 Big or small, our heavy duty polythene bags provide a low cost solution to your packing needs. Especially useful when packaging heavy objects, these clear plastic bags are invaluable in various work areas, whether for domestic, commercial or industrial applications. With high resistance to water, dirt and dust, the heavy duty polybags keep their contents dry and clean while it in transit or storage. The excellent clarity of our top quality poly bags makes it easy for you to check the contents or sort out the plastic bags and group packs together. You can use our polythene bags for a huge variety of protective packaging, ranging from small components through booklets to garments. Sizes range from 4x6ins (10x15cm) to 24x36ins (61x91.5cm), width by length. Hygienic, versatile and strong with welded bottoms, our plastic / polythene bags are also handy and very easy to use. They can be secured with tape or with the aid of our heat sealers.